Students from Rothenburg ob der Tauber made a film about Brettheim in the last days of the war. In it, survivors recall SS atrocities and the arrival of U.S. troops. With the help of Russian and American students, the young Germans made Russian and English versions of the film. Along with an exhibition, the film has been seen throughout Europe, the U.S. and Canada, inspiring students to record their own local histories. When the film group at the Oskar von Miller School [Realschule] in Rothenburg ob der Tauber learned in 1982 that the grandfather of two students had been hung in 1945, it visited the town of Brettheim for the first time. Brettheim is a village in Franconia located 12 kilometers to the west of Rothenburg ob der Tauber. 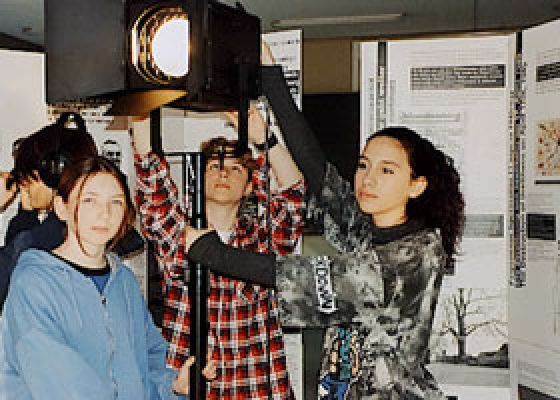 Since that first visit in 1982, the school documentary film group (now in its fifth generation of students) has worked on the history of the village of Brettheim. Despite all the written documentation about events in Brettheim between April 6-10, 1945, statements by Brettheim eyewitnesses were pivotal in the film [see Audio/Video]. In the last days of the war, in April 1945, four Hitler Youth were disarmed in the Franconian village of Brettheim by local inhabitants, who wanted to prevent the destruction of their village in a senseless battle with the Americans. The same evening, the SS arrived in the village and interrogated town residents. The farmer Friedrich Hanselmann, grandfather of two students in our school, reported voluntarily and, because of his involvement in the disarming, several hours later he was condemned to death in a drumhead court martial. When Mayor Leonhard Gackstatter and the Ortsgruppenleiter [local Nazi party group leader] Leonhard Wolfmeyer refused to sign this sentence at the end of the proceedings, they were also sentenced to death two days later in Schillingsfürst, the headquarters of the 13th SS Army corps. 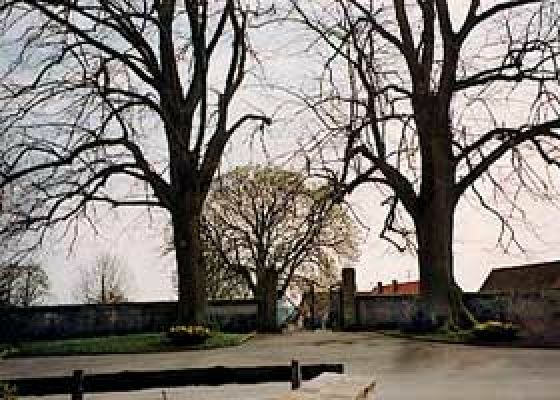 All three were hanged on linden trees in the Brettheim cemetery on April 10, 1945, at about 8 p.m., and their corpses were left hanging for several days as a warning to others. As the Americans advanced toward the village of Brettheim on the morning of April 17, 1945, the SS ordered the mountain infantry to prevent, at all costs, the town's surrender without a fight. Consequently, American artillery, tanks, and eight attack bombers barraged the town for eight hours. (Eyewitness accounts of the burning inferno were among the most heart-wrenching aspects of our experiences in shooting the film.) When the Americans entered the village that same evening, it was "liberation" for many of the village residents. When we started filming, it was clear to us that the village history of Brettheim was only one of numerous painful town histories. It is scarcely possible to record the grief and suffering of these terrible battlefields. Moreover, the fate of one village is not comparable with the lot of another village. Nevertheless, there are certain common characteristics. The war that Germany had started was often directed against civilians in the towns and villages, usually against women, children and elderly men; it left in ist wake immeasurable anguish from Russia to France and from Norway to Italy. Thus, through our film we wished to engage in dialogue with people in the countries affected by the war and to exchange information about the history of their villages. We envisioned that this reciprocal exchange would offer a special chance of reconciliation, even 50 years after the war had ended. 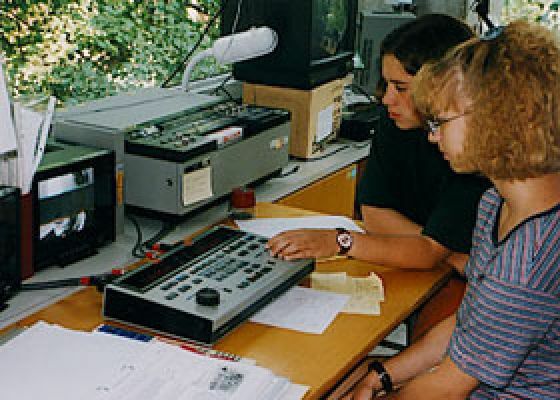 Through the city partnership between Rothenburg ob der Tauber and Susdal in Russia, in 1992 we received the Russian translation of our German Brettheim film. 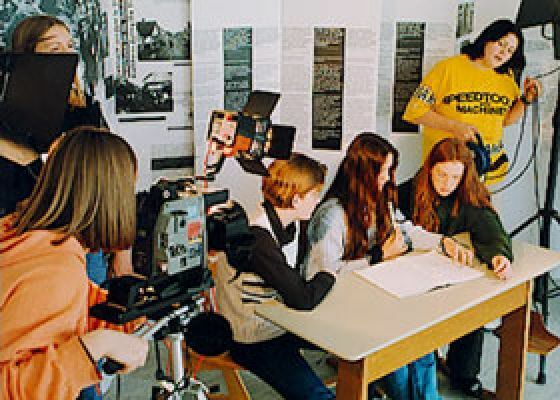 The Russian language documentary about the village of Brettheim was filmed with "Soviet" students from the garrison at Nohra near Erfurt, shortly before the U.S.S.R dissolved into various Soviet successor states. A lively exchange resulted from this shared work. A film about one Russian war locale is being prepared. 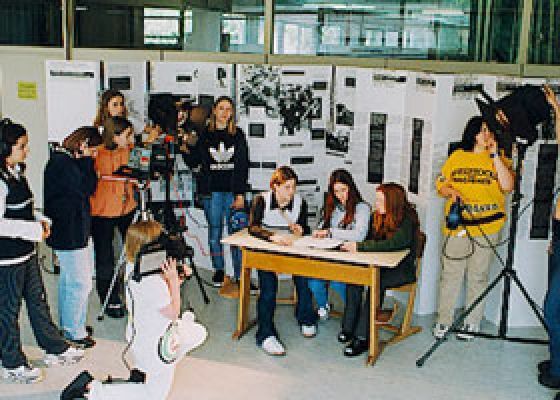 Other countries were also motivated by our film; thus, for example, a student group at Ashram College in Alphen in the Netherlands completed an excellent film about Dutch resistance in 1998. Currently, a French version of the Brettheim village history is being prepared as well as a film about a French locality. It would be wonderful if other schools with similar topics would participate so that a cooperative youth film and exhibition project could incorporate the richness of memories of the older generation. Such collaborative efforts would enable us to cross boundaries and exchange "histories" and "stories" [double meanings of the German word Geschichten] among various countries. At this point, 40,000 people from all over the world have seen our films. Members of the film group have attended 300 presentations outside Brettheim. Discussions after the film were the most significant aspect of these meetings. At teacher seminars, the discussion programs frequently continued throughout the entire day. The five volumes of entries in guest books frequently confirmed our belief that these exchanges of experiences and insight into the students' work extended beyond the film. For us, the films are the starting points for encounters and cooperative work. For this reason, we do not lend or sell our films. Thanks to intensive collaboration with the headquarters of the Goethe Institute, we developed a "suitcase exhibition" supplementing the films, which because of its size,.could be carried in hand luggage and could be displayed within five minutes. The multilingual texts are directed at a broad foreign public (version I is in Russian, German, and English; version II in French, German, and English; Version III in Spanish, German, and Portuguese). In addition, albums were prepared. These are identical to the large exhibition but were developed only in the language of the corresponding country. As an "exhibition that one can take home," it especially allows teachers to prepare for classroom activities and to conduct assessment afterwards. Meanwhile, the exhibition together with the film and the "mini-exhibitions" have been displayed in villages, schools, and seminars in Germany and also, along with students from the film group, at events in Goethe Institutes in Milan, Moscow, San Francisco, Montreal, and Toronto. Invitations have arrived from numerous foreign cities from the United States to Russia. The emphasis in the fall of 1998 was Spain and France. We are especially pleased when interested parties come to Brettheim and learn directly about "making history understandable and walkable." On May 8, 1992, a memorial was established in Brettheim called "The Men of Brettheim." It is a museum of village history and all our films are available there for visitors. Since January 1998, those who are interested can visit the web site about the memorial and they can also experience a virtual tour of the museum [see Reference: Contact information]. For all interested parties unable to travel to Brettheim, we offer a presentation of our project with a film, an exhibition and a dialogue in their own localities. We are pleased by every invitation [see Reference: Contact information]. There is also the additional possibility of learning about our project in cooperation with the local Goethe Institute.